This past weekend I worked in the SketchUp book at the amazing USA Science and Engineering Festival, in my own town of Washington, DC. I heard that 250,000 were expected to attend, and that that number was actually exceeded. It's by far the biggest show I ever saw, with five enormous hangar-sized rooms full of rockets, chemisty experiments, math games, stage performances, you name it. And of course, lots and lots of 3D printing! You'd need three full days to see it all. I was there with my Afinia printer, showing how easy it is to take a SketchUp model into a printer. The second most popular model was the Lego bunk beds, but in the shuffle of the crowds, each one I printed out managed to get stolen (the nerve!) before I could take pictures. But I did have a couple left of the MOST popular model - an elephant whose legs actually move. (You can find this model on Thingiverse.) People didn't believe it was a single print, and I myself hadn't seen something like this before! With the Afinia I was able to create the striped version easily. If you print this yourself, watch out - the trunk breaks off easily. I'm spending today printing out a few of these for my family. The printer worked like a champ all weekend. It was running pretty much without a break all day Friday, Saturday, and Sunday, and other than a couple of recalibration, needed no maintenance. All I did today was clean the nozzle and clear out the gears. It even traveled well in my rolling suitcase. It was a great show, and I hope to do it again next year! 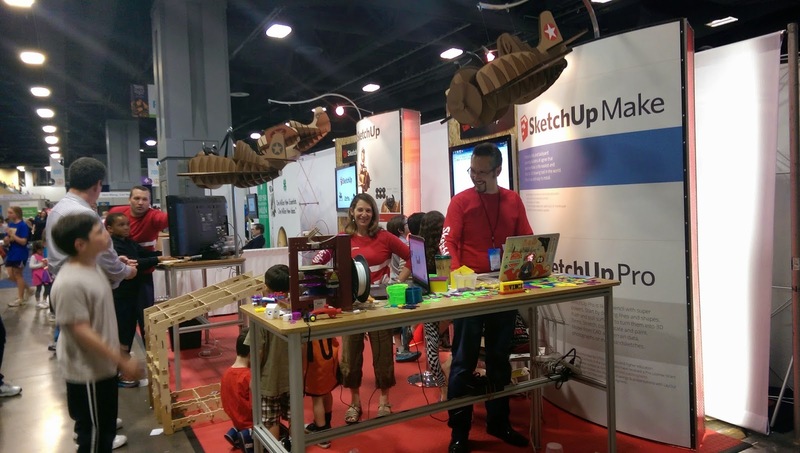 I also hope to join SketchUp at some upcoming Maker Faires.